To view 35 more pictures, aerial photography, interactive maps and the full, detailed description of the Sandy Creek community, please Login. Sandy Creek Estates is a new construction community just waiting for you! 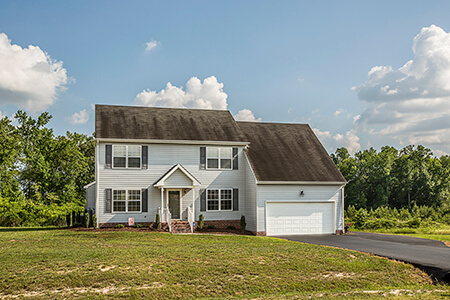 Nestled in the welcoming countryside of Franklin, Virginia, Sandy Creek Estates offers you the pleasures of large green lots with more roaming room than city life can offer. Just a short drive into the country affords you more space and house for your money than you'll find in the greater Hampton Roads area. Yet you're still within commuting distance to Norfolk Naval Shipyard, the Naval bases as well as Langley Air Force Base. Choosing to build a custom home in Sandy Creek Estates will give you the home of your dreams at a more affordable price. You can custom-build a home with details like hardwood flooring, spacious kitchens with granite counter-tops and large islands, spacious first-floor master suites with spa-like bathrooms and walk-in closets. You can also choose options like open floor plans and vaulted ceilings. The Norman Rockwell feel of Franklin adds to the allure of building in Sandy Creek Estates. Walking downtown transports you back to the simpler days of front porch living. A stop in one of the locally owned restaurants for lunch makes you feel like you could be part of this close-knit community. This quaint little town seems frozen in time, yet offers many modern conveniences as well. There's a state-of-the-art YMCA complete with a 25'×75' heated indoor swimming pool as well as an outdoor pool, tennis courts, and gymnasium that features year-round family activities. The local hospital Southampton Memorial offers quality medical care that rivals anything you'd find in a larger city. Five higher education campuses are all within a 60 mile radius, with the Paul D. Camp community college located right in Franklin. Everything you need is right around the corner. Sandy Creek Estates could be the place you've been waiting to call home. Call us today to start planning your dream home in the country! Send me more information about the Sandy Creek new home community. Our agents gladly offer FREE property tours of Sandy Creek, Franklin and homebuyer consultations to all serious buyers.